President Obama weighed in on the Native American movement to block a disputed oil pipeline today as he hosted more than 500 Native American leaders for his eighth and final White House Tribal Nations Conference as president. Last Friday, the Department of the Interior, Department of Justice, Department of the Army and other federal agencies officially invited the Standing Rock Sioux Tribe for consultations on "how the Federal Government can better account for, and integrate tribal views, on future infrastructure decisions throughout the country." The movement to block the 1,172-mile pipeline, being built by the Texas-based company Energy Transfer, has united tribal groups and environmental activists from across the nation, with hundreds still camped out near the Standing Rock Sioux Tribe's reservation in North Dakota. Chairman Dave Archambault II of the Standing Rock Sioux Tribe praised the Obama administration's relationship with Native American tribes, saying, "Along with the ongoing review of this pipeline, the Administration has taken a major step forward by initiating consultation on nationwide reform on the protection of tribal interests regarding infrastructure projects. We will continue to advocate for the protection of our water, lands and sacred places, and the necessary respect as Indigenous Peoples." 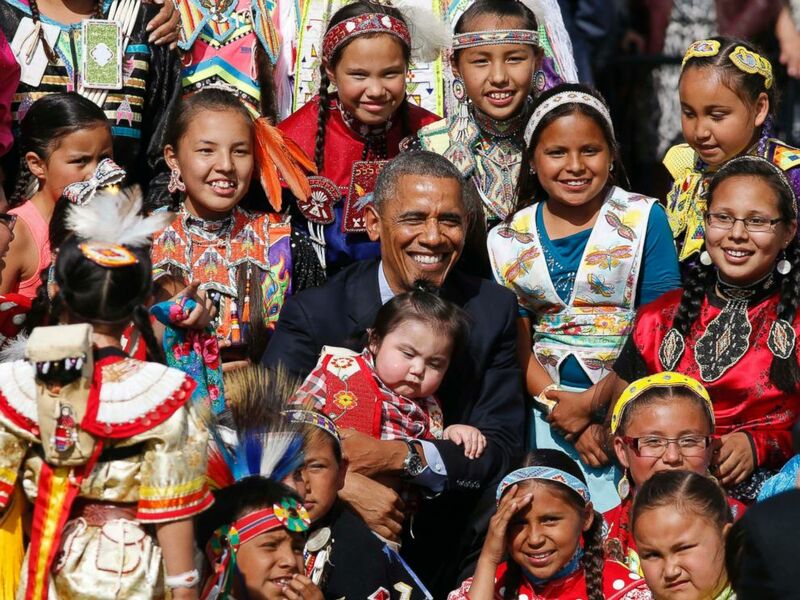 Barack Obama holds a baby as he poses with children at the Cannon Ball Flag Day Celebration at the Cannon Ball Powwow Grounds on the Standing Rock Sioux Reservation in North Dakota, June 13, 2014.